As African Americans in Arkansas emerged from slavery in the aftermath of the Civil War and the Emancipation Proclamation, it was the job o the Federal Freedmen’s Bureau to help them build bridges to freedom. The bureau supported former slaves as they assumed new names, searched for lost family members, moved to new homes, worked to provide for their families, learned to read and write, formed and attended their own churches, created their own histories and myths, and struggled to obtain land. 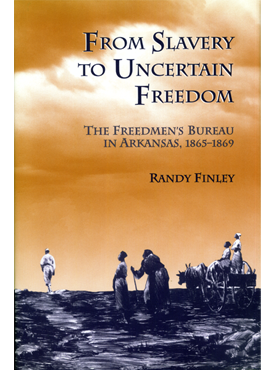 In this account of hte gains made by Arkansas freedman during this period, Randy Finley describes the ways that blacks, whites, and bureau officials undertook their foles in a new society and began to live the complex reality of freedom.